I’ve been collecting ideas for developing fine motor skills in young children and thought paper clips would be a good idea because E.’s not done it before and it’s a no cost activity. I realised that it was unlikely he’d be interested in ordinary paper clips so I pinned these but I didn’t have any thin ribbon so…. 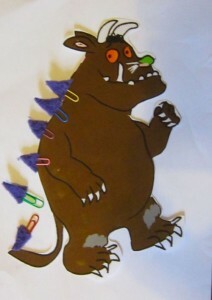 The ‘Gruffalo’ came from Teachers Pet (the website doesn’t seem to be working at the moment so it’s not a direct link). The prickles are purple felt that I hand sewed on. 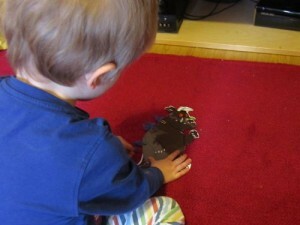 E. found it really tricky so it’s going to take some practice until he can do it but it kept his interest.